The Info View is an alternative representation for an element that is typically more appealing to managers or non-technical stakeholders. The Info View displays the name, stereotype, notes and a small icon that represents the shape of the element. 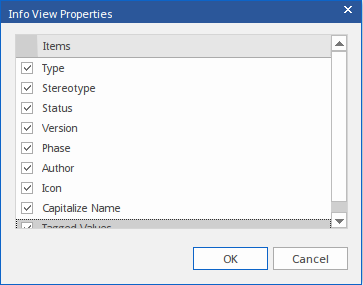 Other element properties can be displayed by using the 'Visible Properties' dialog. The Info View is a useful alternative representation of an element in a diagram which is often appealing to managers and high level stakeholders. The Info View will show the name of the element, a small Icon that signifies the type of element, additional properties and the element's notes. 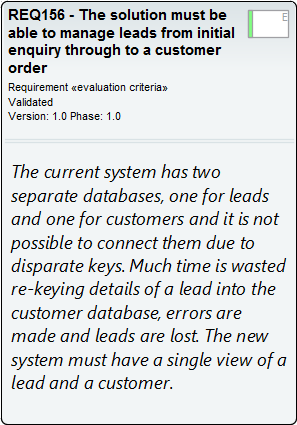 It is useful in situations where the audience of the diagram does not need to know about the details such as Attributes, Operations, Database Columns, and other details. The properties that are displayed by the Info View representation can be configured to make the element more meaningful to particular audiences. The 'Visible Properties' dialog allows properties to be selected for display. A portion of the notes will be displayed using the available space in the Info View; if all the notes need to be displayed the diagram element can be resized to provide space for the text.